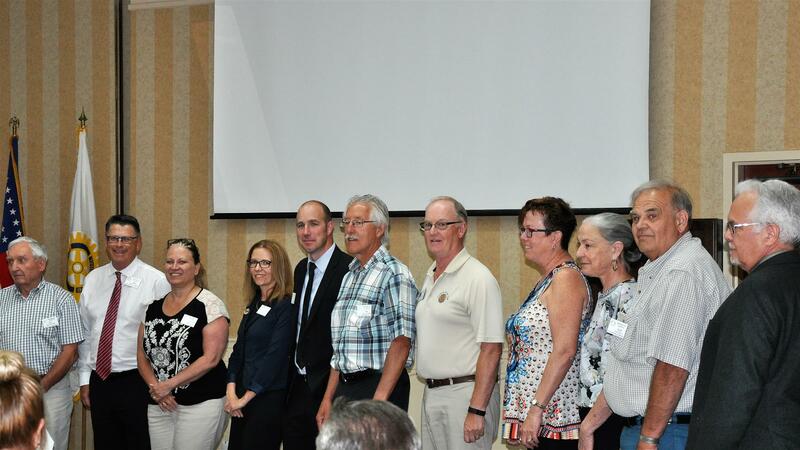 The new executive and officers of the Rotary Club of Medicine Hat were inducted on Monday July 26, 2017. First it was an opportunity to thank Uwe Krickhahn, who stepped into the void left by the passing of Ernie Benesch and helped move the club forward. This was his second term as President, separated by 25 years of perfect attendance, and he's seen a lot of changes in the Rotary world over that time. 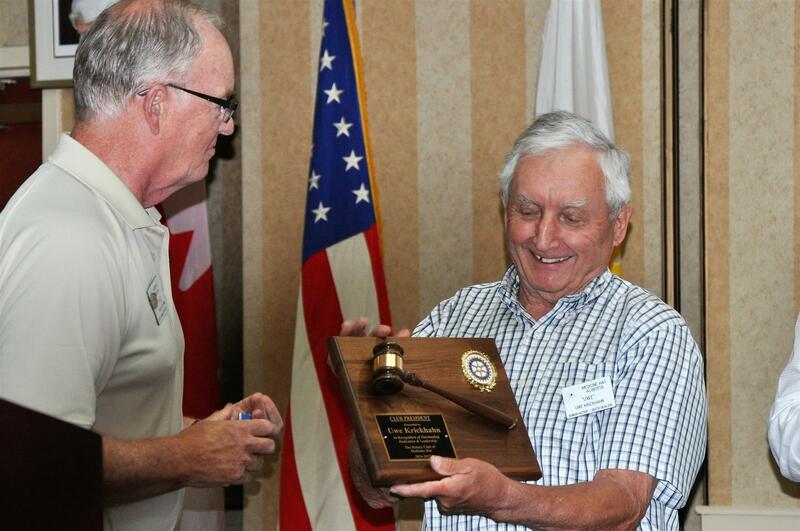 He took a minute to thank his Board and several Rotarians for their contributions during this past year. He singled out Sandy Mackay for his donation of Paul Harris points, to make the club a 100% PHF club. He also pointed out the financial contributions of several and the weekly contribution of Herman Wahl to the meeting, with birthday and anniversary roses. On behalf of the Board and the Club, Secretary Doug Fleming presented him with a token of our appreciation. AG and Past President Dave Panabaker then performed the induction of the Board and Officers for 2017 - 2018. Our new President is Karen Blewett, and the President-elect is Chris Perret. A round of applause for both Uwe's efforts and for the new board was given, and special executive pins were given out by Secretary Doug Fleming. President Karen then did a short presentation about some of the focus area's that she sees going forward this Rotary year. 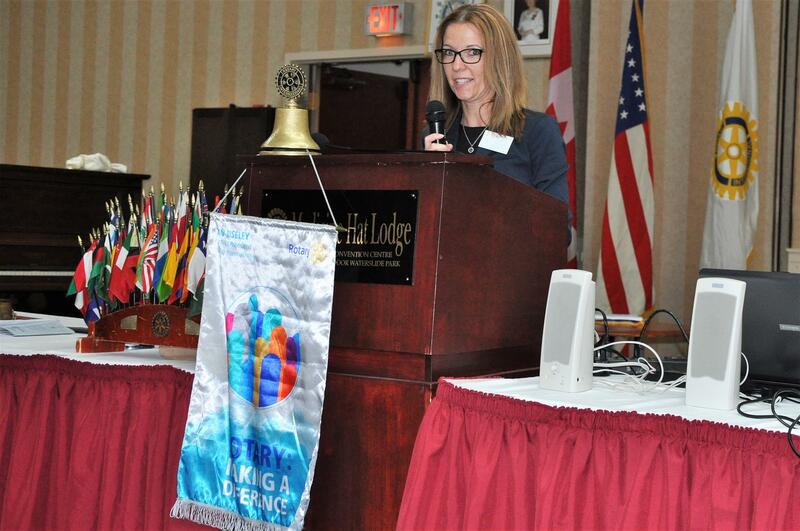 She introduced the theme for the year, "Making a Difference" and also spoke about an upcoming Rotary International led advertising campaign about Rotarians as "People of Action". She spoke about the recent District survey, the work done previously by the club on our Strategic Plan and how there seems to be reasonable alignment. She spoke about meeting changes that she sees coming in this year to modernize the meetings and ensure timely completion of each noon meeting. She also sees a more consistent schedule of programs, based on 1 community presentation, 1 business meeting, 1 Rotary information and 1 social/fellowship meeting each month. Best wishes to President Karen and the whole board for 2017-2018.